No Pedaling, No Pushing... Just Rock n'Roll! AllegroMedical.com presents The TRIKKE Carving Vehicle Kids T6. Time to get the big kids! This terrific scooter lets riders ages 8-13 to not only boost their confidence while riding and exercising, but to look awesome while doing so. 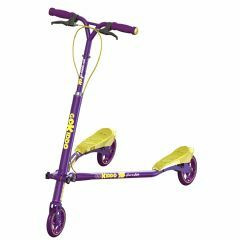 This 3-point, 3-wheel carving scooter is used in numerous Physical Education programs across the US, and they’re calling it “exercise disguised as fun.” Enjoy an incredibly easy way to get the kiddos moving…and having a great time! Trikke’s design allows the rider to naturally engage his entire body throughout the ride. Legs are active for balancing and shock-absorption and arms punch for power-thrusts and hang on for stability and control. The Trikke 3-wheeler allows you, the rider, to feel the miracle of your own body and mind working in graceful unison. The bi-products of the ride are joy, health, fitness and a renewed appreciation for yourself and your life. Often mistaken as a scooter when seen for the first time, the Trikke immediately sets itself apart from other wheeled sports when you see a rider hop on and take the first few turns gracefully carving around without touching the ground. "What makes it move?" and "Where are the Batteries?" are usually the first words to come out of a first timer viewer's mouth. Trikke's movement has the rhythm of in-line skating, surfing, snowboarding, or skiing on pavement because the entire vehicle leans in unison due to its finely coordinated (and patented) cambering mechanism. Rhythmic weight transfer from one leg to another is the key to propelling the Trikke forward. It's fun to ride and it feels great! Trikke cambering vehicles allow a rider to utilize a fundamental physics principle known as the Conservation of Angular Momentum. While traveling on a slalom-like path, a rider moves his center of gravity (his mass) from left to right (for example) while leaning the vehicle into a right turn; this movement of the rider’s mass is towards the center of the turn, thus decreasing the radius of an imaginary circle which is formed around the center point of the rider’s turn. This movement of mass to the center of the circle acts in the same way that an ice-skater increases her velocity if she pulls in her arms (decreasing her radius) while she is spinning on the ice. Because of the vehicle’s design, a rider can learn to maximize the velocity generated from making each turn and then transfer that momentum into the next turn, and so on and so on. Propulsion can be so effortless that it feels like magic, or as strenuous as a full-blown sprint. Your choice. Because of the three-wheeled stance, the Trikke cambering vehicle is extraordinarily stable. Dual rear brakes provide superb braking power. Independently controlled, the brakes also allow for unusual lateral control for trick riding. In the simplest of terms, you rock & roll to make a cambering vehicle go. An experienced rider uses the entire body in a gracefully coordinated motion that leans the vehicle into each turn and transfers the momentum of each forward thrust into the next turn and the next. A trikke ride combines the utility of human powered transportation with the thrill of carving deep surf and ski style turns. Like in other carving sports, everyone develops their own unique, individual riding style. Each ride becomes a personal expression session. A myth relating to Trikke cambering vehicles is that the necessity for carving creates a less than hospitable situation on crowded bike paths or boardwalks. Quite the contrary. Because Trikke cambering vehicles is so unusually quick and maneuverable, you can easily navigate the most crowded of environments with total control. Unlike bicycles that have limited maneuverability and skateboards, blades, or scooters that have little or no braking capability in sudden situations, cambering vehicles can quickly dodge or brake. Many a collision has been avoided by TRIKKE™ riders on the densest boardwalk on earth --- Venice Beach, CA. Cambering vehicles blend harmoniously with the masses.